For this problem set, you are required to work in an assigned team as shown below. Unlike other assignments, your group should strive to divide the work in such a way that you can work independently on different parts, and combine your work to solve the problem. In your design document, you will document each member's role. Reading: Chapter 13 (except Section 13.11, we won't cover Data Models). Learn to solve a problem by designing using data abstractions. Learn to design and implement data abstractions. 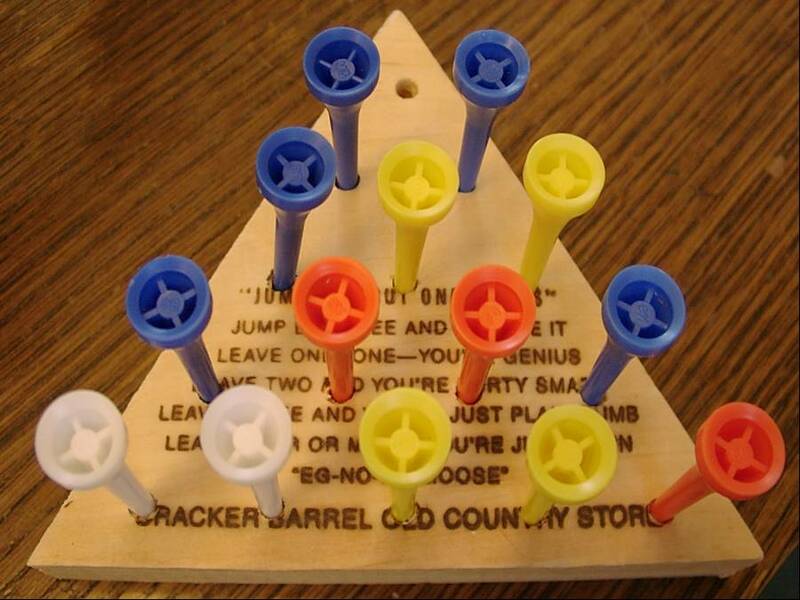 Prove you are a genius next time you go to Cracker Barrel. In Problem Set 3, you implemented a data abstraction given a specification. In this assignment, you will design and implement several data abstractions to solve a complex problem. It is up to you to decide what those data abstractions are. 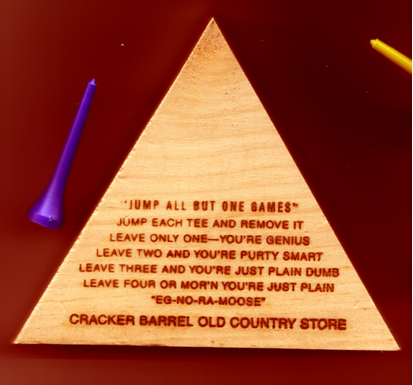 The Cracker Barrel peg game is a one-player game played on a board containing fifteen holes. The game begins with one hole empty and the other holes filled with pegs. The goal is to remove all but one of the pegs by jumping pegs over one another. A peg may jump over an adjacent peg only when there is a free hole on the other side of the peg. The jumped peg is removed. As anyone who has ever attempted to solve the peg game can appreciate, it is difficult to win. For this assignment, you will develop a program that takes as input a position on a peg board, and produces as output a sequence of jumps that wins the game (leaves a single peg), if such a sequence is possible, or a message indicating that there is no winning sequence. Your program may reject input files that are not in the shape of a triangle. If the input file format is incorrect, your program should print a helpful error message and exit. Note that the format is incorrect if the number in the first line does not match the number of rows in the file. Otherwise, your program should either output a winning sequence of jumps if one exists, or a message indicating that there are no winning sequences. Your program should print out one of the winning sequences by printing out each jump as the position of the peg that starts the jump, and the landing position. There may be several possible winning solutions for a given initial configuration. Your program may output any legal solution. If there is no possible solution, your program should output a message indicating that there is no winning solution. One way of solving a peg board puzzle is to try all possible legal jumps, and then try all possible legal jumps on the resulting boards. The peg in position 4 jumps over the peg in position 2, landing in position 1. The peg in position 6 jumps over the peg in position 3, landing in position 1. If we recursively try solving each board that results, some choices will lead to winning positions. Searching all possible boards and moves until a winning position is found, or all possibilities have been exhausted without finding a winner. A design document is due on Thursday, 2 October. You should bring two copies of your document to class on 2 October. A modular dependency diagram showing the classes you will use to implement your solution. Specifications of those classes. All your class specifications should include an overview (that describes the data abstraction, its mutability, and introduces an abstract notation) and specifications for the public operations of the class. Work division. Description of who will implement each class in your design, devise unit testing strategies and test cases for each important class, and devise integration testing strategies and test cases. Specifications of those classes. All your class specifications should include an overview (that describes the data abstraction, its mutability, and introduces an abstraction notation) and specifications for the public operations of the class. Descriptions of your representations, rep invariants and abstraction functions for those classes. If you changed your mind about any of the representations since the design document, explain why. All the code you wrote to implement your program. Each datatype implementation should include a rep invariant and abstraction function, documented in comments in the code. Your code should be annotated with ESC/Java annotations, and checked by ESC/Java. Submit your code using the web submission form. An explanation of how you tested your code. This is not a list of all the test cases you tried, but an explanation of what you did to validate your code. Include any interesting programs you developed to help your testing. Credits: This problem set was developed for UVA CS 2001J Fall 2003. We used a version of the Peg Board game for an excercise in CS200 Spring 2003. You can learn more about the Peg Board game from http://www.cs.virginia.edu/pegboard/.